Def Leppard have just announced their 2018 UK and North American tours with Journey and Cheap Trick which starts in May. The Hysteria & More tour takes place in December in the UK with 11 arena shows. The entire Hysteria album will be performed live for the first time in the band's homeland. With 11 shows this will be the most arena dates played by the band on any UK/Irish tour. The tour includes their first ever show at the The O2 Arena in London rather than the usual Wembley Arena. Cheap Trick are the special guests. This venue holds more people than Wembley with a capacity of 20,000. Housed inside the old Millennium Dome complex. This will be the band's largest London headline show since Earls Court Arena in June 1992. They will also make their debut at the Arena Birmingham having previously only played arena shows here at the NEC/Genting Arena. This venue was previously known as the National Indoor Arena and the Barclaycard Arena and has a 15,800 capacity. Tickets go on sale for these shows on 26th January. 58 dates have been confirmed across the USA and Canada starting in Hartford, CT on 21st May and ending in Los Angeles, CA on 6th October. The tour will include ten outdoor stadiums shows and has Journey as the co-headline act with headlining duty shared by each band as on the 2005 Rock Of Ages tour with Bryan Adams. They will also be performing at the famous Madison Square Garden. The first time as a proper headline act after a 1992 charity show there with the band set to close this show. This tour was first mentioned in March 2017 by Phil Collen who stated the band would play a world tour in 2018 and hopefully release new music. He later said the tour would visit "Europe, Far East, Australia, everywhere really and the US and Canada." 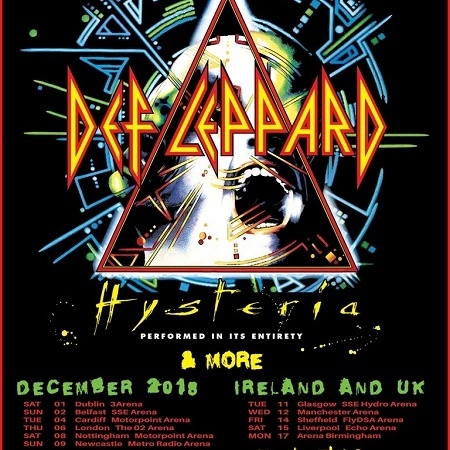 Journey bassist Ross Valory first mentioned news of this tour line-up during an interview in June 2017 describing it as "a 2018 world tour with Def Leppard". 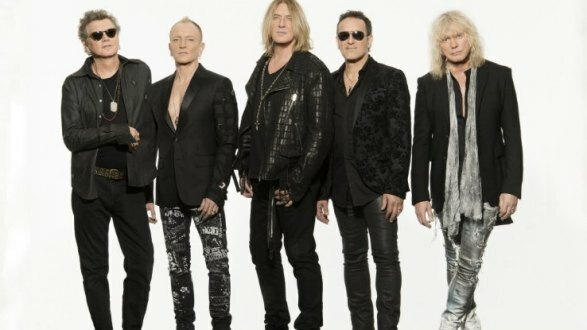 Def Leppard and Journey previously toured together in 2006 on the YEAH! tour in the USA. 74 shows were played with 848,342 tickets sold and a total gross of $38.7 million. The tour won 'Most Creative Tour Package' at the annual Pollstar Concert Industry Awards in 2007 and was Number 14 on the Pollstar Top 100 North American tours list for 2006. Tickets for the North American tour go on sale on 3rd February. Billed as 'The Hysteria Tour' and with the band performing the full album in its entirety for the first time in the UK/Ireland. 'Excitable' is currently the only album track never played anywhere in the UK or Ireland. All other songs were played in Ireland and the UK between 1986 to 1992 (and beyond). Note - Rogers Centre can be both an indoor and outdoor venue with a retractable roof. These will be the first Def Leppard UK and Eire tour dates since the sold-out Arena run in late 2015. The band will return to Sheffield Arena for what is sure to be a monumental homecoming show, in addition to their first ever show at The O2, London. 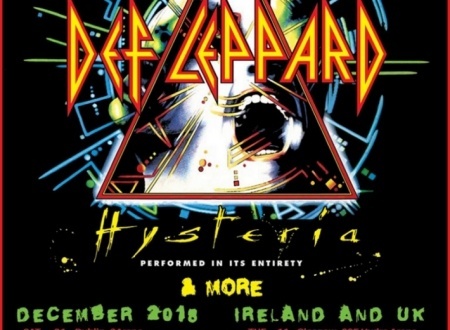 Late 2018 will see the band deliver what many UK and Eire fans have been waiting for – the “HYSTERIA” album performed in full plus other Def Leppard hits across eleven arena dates in December 2018 with special guest CHEAP TRICK! 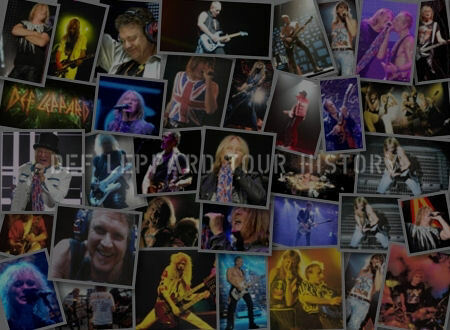 Coinciding with the band’s full catalogue of iconic albums being added to streaming and downloading services, Def Leppard have announced headline UK shows playing the seminal Hysteria in full, as well as other songs from their eleven studio records. They’ll be joined by Cheap Trick across the tour. 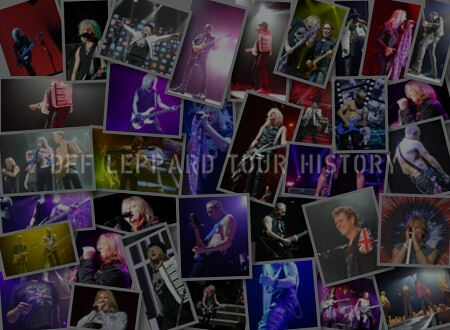 Def Leppard’s full recording catalogue is now available worldwide, and has been made available on streaming and download platforms. To date, the band have sold more than 100 million albums worldwide, becoming one of rock’s most influential bands. Guitarist Phil Collen adds: “We felt we’d been left out of the digital party, but it’s a thrill for us to finally accept the invitation and to be able to say “Yeah, you can stream us, download us and hear us on all digital outlets”. The band, completed by Rick Savage, Rick Allen and Vivian Campbell, celebrate an extensive musical history, from their first ever chart hit Wasted through Rock of Ages, Animal, Love Bits and Let’s Get Rocked. 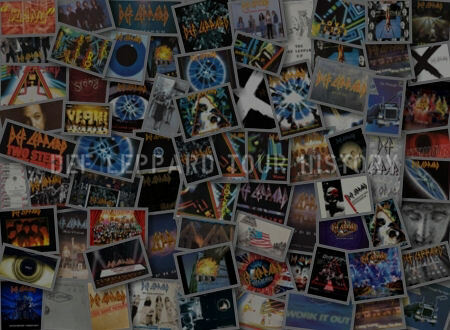 Their catalogue includes two of the best selling albums of fall time, with more than 10 million copies sold of Pyromania and Hysteria in the US alone. Together they house the likes of Pour Some Sugar on Me, Hysteria and Foolin’. 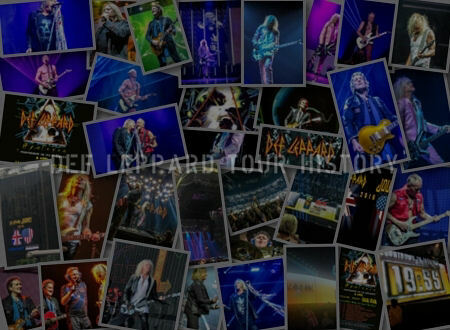 The rock legends have also announced UK arena dates, during which they will perform Hysteria in full. The run includes their first ever live show at London’s O2, as well as a homecoming show at Sheffield Arena. 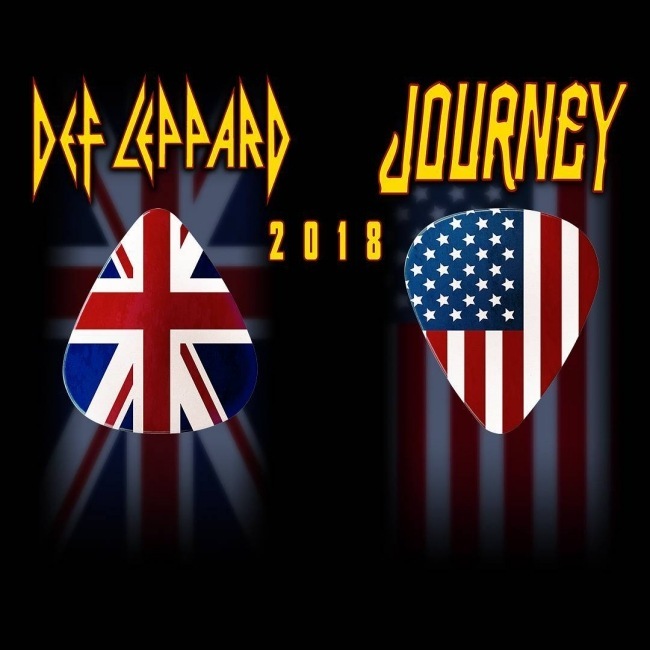 Promising to be the Tour of the Year, two of the world's greatest rock bands - DEF LEPPARD and JOURNEY - are teaming up for a massive co-headlining North American tour composed of both stadium and arena concerts, half the shows being closed by Journey and half by Def Leppard. The tour, promoted by Live Nation, kicks off May 21st in Hartford, Connecticut, at the XL Center and will feature complete sets and all-new production from both bands, and an arsenal of their hits such as "Pour Some Sugar on Me," "Lights," "Photograph," "Don't Stop Believin'," "Rock of Ages" and "Faithfully." Tickets go on sale beginning Saturday, February 3, at LiveNation.com. Stay tuned for presale and VIP ticketing information. The 58-city tour will hit ten stadiums - Toronto's Rogers Centre; Atlanta's Sun Trust Park; Detroit's Comerica Park; Chicago's Wrigley Field; Denver's Coors Field; Minneapolis' Target Field; Boston's Fenway Park; St. Louis' Busch Stadium; San Francisco's AT&T Park; and San Diego's Petco Park - as well as world-famous arenas, such as Madison Square Garden in New York and the 'Fabulous' Forum in Inglewood, California. A full list of tour dates can be found below. Neal Schon said, "These co-headlining Journey/Def Leppard dates will be epic classic rock shows. So many hits. It will be great to see you all, friends!" Said Joe Elliott, "This tour is going to be a blast! We've toured together before and it was massive. This time it's going to be even bigger and better!" Jonathan Cain added, "We are all anxious to share our sound with the world again and, along with Def Leppard, we are part of a world-class package to the rock stage that spans decades and represents a multi-platinum legacy."